When Bernice moved to Pennswood, her talents were quickly apparent, and she was asked to chair the Pennswood Art Gallery Committee. She used her combined management and art industry experience to guide the gallery into the present, an effort that was boosted by the gallery’s prominent location in the remodeled Community Building. Pennswood includes two other galleries that highlight art created by residents; however, the Pennswood Art Gallery is the only gallery featuring exhibits by artists from outside the community. 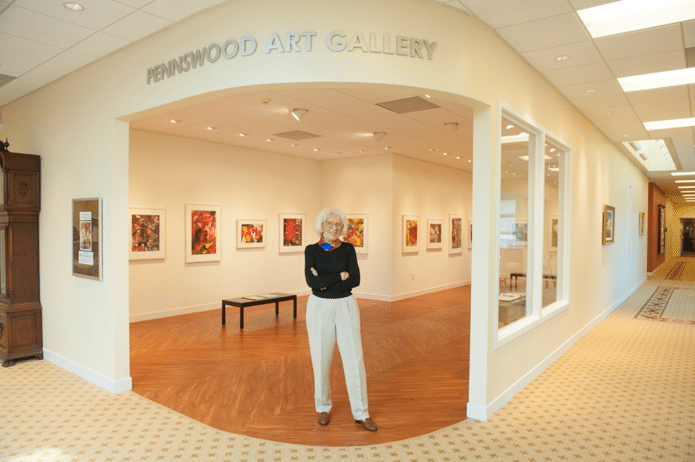 Artists who exhibit in the Pennswood Art Gallery range from all around the Pennsylvania-New Jersey-Delaware tristate area. For example, the gallery has featured more abstract art recently, because artists in the area tend to be trending toward that style. One of the most popular recent exhibits was by an abstract photographer, who layered photographs on transparent surfaces and spun neon onto them, creating vibrant bursts of color. Bernice and her team handle all the artist outreach electronically and do all the necessary research online to stay current in the art world. This research helps in deciding to whom exhibition opportunities will be offered. “An hour before a new exhibit opens, the artist will give a talk in Pennswood’s Penn Hall to explain the exhibit and their journey as an artist,” Bernice said. “It really sets the context for the exhibit and gives the residents a chance to meet the artist and ask any questions. The artist talks really let our community learn about and appreciate the art.” The artist talks and exhibitions are free and open to the public. Ten years since taking charge, Bernice says that she still loves her role and enabling the satisfaction that residents and artists alike gain from the gallery. The Pennswood Art Gallery is right across from our welcome desk, and it’s featured as one of the first things our visitors see. We’d love to host you for a tour and show you the rest of what makes our community special. To coordinate your personalized tour, simply click here or call 215-504-1118!